This last week was super sweaty and busy and I spent so much time feeling thankful for the laughs along the way. I didn’t get as far on the iced coffee as I thought I would so I stuck it in the frig for later. I may or may not be sipping on it as I type. Tropical Storm Isaac will likely complicate my runs this week. Granted, Isaac will be skirting by the (not-so) Sunshine State, but we’ll be getting remnant rain from it regardless. I dislike this, but I am thankful we’ll be safe. In the meantime I will continue to drag my dogs outside in the rain for their potty breaks. Hmm… I should count that as another workout. If the rain curtails my running this week (I don’t do treadmills), I will just improvise with extra yoga and strength training where I can. How/will Tropical Storm Isaac curtail your workouts this week? Yes, that’s right. I said ‘furniture strength training.’ It’s the new thing… everyone is doing it. At least Rox, Donnie and I were! It all started when Rox and I both got held up working late on Thursday and had to miss my favorite yoga class. Instead we decided to go for a run in the new neighborhood (which really isn’t that new to us since it’s the neighborhood we both started to run in together). While we were running I asked Rox if she would mind following Donnie and I to a co-worker’s house after our run just in case we needed any help moving the armoire I had purchased. It was an IKEA piece, so I assumed that it would be made of lightweight particle board (as most IKEA pieces are), but was asking Rox as a precautionary measure. Rox, being the wonderful friend she is, agreed. A friend later declared that this was the classic old “bait and switch” though that wasn’t my intention. I really didn’t think we’d need her! After our run, we set off for what would become our second workout of the night. We set up with Donnie on one end and Rox and I on the other and proceeded to move through a series of lifts and turns. We soon started to erase all doubt from Donnie’s mind. With only the occasional help of a 4th person (helping steady us so we didn’t scratch up the walls) we got the piece out to my car. We encountered a major obstacle when we tipped the armoire to slide it into my car and it wouldn’t fit. Until last Thursday, my Honda Element (nicknamed “Ele”) had never met a piece of furniture that wouldn’t fit. All we needed was one more inch! We set the armoire down and stared at each other. The reality that we would have to move this back into the house and do this whole thing again another day was starting to set in and sending me into full panic mode when Rox spoke up. She knew who we could call. I love Rox for many reasons, one being that she’s strong (mentally and physically) and two being that she thinks quick on her feet. While Donnie sat outside guarding our armoire, Rox and I set out to borrow an Expedition from incredibly graceful folks. We came back with the Expedition and managed to slide the armoire right in. Perfect fit! Back at the house we slid the armoire out and decided on a game plan: We would carry the piece straight into the house and to it’s new home without resting or stopping. Donnie: Can you handle it? 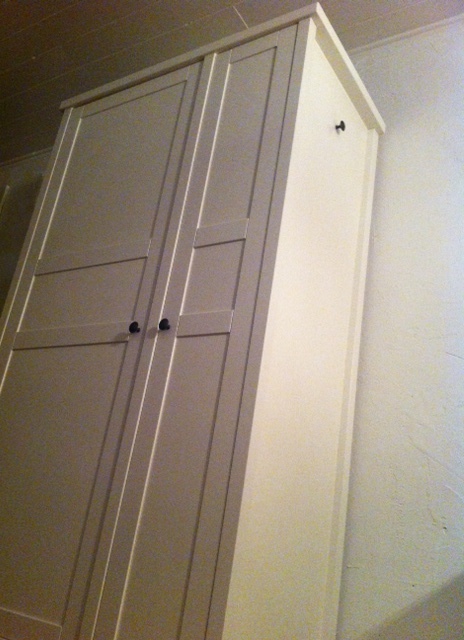 Our new armoire, which is not made of thin particle board. After Thursday night’s excursion, I decided I would take it easy the next few days. My back was in full agreement. Have you tried furniture strength training lately? Last night I planned to hit up a simple yoga basics class, but was talked into taking a hot ashtanga flow class instead. I ended up staring at my sweaty self for almost an hour. You see, the hot studio recently underwent some renovations, one of which was a mirror added to the length of the class (there used to be one just at the short end front of the class). Now instead of facing the old short front, we all turn our mats and face the long mirrored side of the class room. I suppose it’s so more people can see their form in the mirror. All I know is that if you’re late, like I was yesterday, you get stuck right in front of the mirror. Staring at yourself. And if you’re as close as I was yesterday, you’re also trying not to break the mirror during a sun salutation. After taking an entire hot yoga class placed strategically right in front of myself a mirror, I have made some very important observations. Observation #1: I sweat… like, a lot during hot yoga. Like drip drown my balls a lot. My entire body was crying sweating. However, on the outside I just held my pose and breathed. Observation #2: I have big brown eyes. And by “eyes” I really mean puppies. Melons. Lady lumps. Flotation devices. I didn’t think I was wearing an exposing top, yet my cleavage still looked like a giant, shiny, sweaty mountains. I made a mental note to start wearing turtlenecks to class. Does Lululemon make yoga turtlenecks? Observation #3: I have a lot of work to do. Your daughter really needs to work on everything when it comes to yoga. Except for shavasana. She seems to do that okay. Observation #4: It’s really hard not to stare at yourself when you have no where else to look. I tried looking up. I tried looking down. I tried squinting so everything was a blur. Observation #5: Waterproof makeup does work. On the bright side, I did confirm that my waterproof eyeliner and mascara (that were applied in the morning before work) are indeed waterproof. If only I could say the same for my hair. Have you ever had to take any fitness class in front of a mirror? How does it make your feel? Last weeks was one of those crazy weeks that ends up with you screaming in your car. If you’ve never screamed in your car, you should really try it. It’s a nice stress reliever. The month of July is notoriously busy at my job and last week was my second week of going full force. Perhaps it wasn’t smart of me to make plans for every day after work, but after the yoga challenge, I was excited to rejoin the social world. My friend Rachelle invited me over to her place for a virtual wine tasting. You never have to ask me twice if it involves wine and food and lady time! On my way over, I stopped at Whole Foods to pick up some “hard cheese.” I’m no wine aficionado, so I asked the Cheese Lady for some help. After I told her what type of wines we would be tasting, she suggested a gouda. I asked what I should pair the cheese with (thinking she would respond with a cracker), she suggested a peach or a pear. I opted with pears, since they are crispy and I wanted that texture. When I got to Rachelle’s I was super excited to see the food spread, and my friends of course! My day was super busy, so I had to force myself to ignore that headache I woke up with. After work I took off towards College Park, to join the Central Florida Lady Bloggers at Taste for the July meet-up. It was a large group of us, and I got there late. I was pleasantly surprised to find myself sitting next to Victoria from Running Peanut. She’s about 19 weeks pregnant, but is tiny and you can barely tell. I spent the early part of our meet-up asking her fun pregnancy questions. The second half of the meet-up we were led in a discussion of how to fit in blogging in the midst of our busy schedules. There were a lot of great ideas shared, but I was too busy figuring out how I was going to fit in my exercise last week to think about blogging. Ha! Another busy day at work followed by an hour and a half of Ashtanga. Somewhere in between work and yoga I did some car screaming. After yoga I found out there was a small hiccup in the home buying process. This was just what I needed to go home and cry. Honestly, if I hadn’t been so worn out from my day I think I would’ve taken the news in stride (as I’ve taken the whole home-buying process). However, I was too tired to be strong. I hit my snooze for an hour straight and then at the very last possible minute decided that I was going to wake up after all and go to my 8:30 AM Ashtanga class. I’m super thankful for my new yoga friend that knows I have the habit of walking in at the last minute Saturday mornings and now saves me a spot next to her so I don’t have to practice at the front of the class. I spent the rest of my day running preliminary moving errands (donating books, buying storage bins, taking all of my CDs out of their plastic and into a organizer, drinking a Venti frapp, etc.). I was pooped, but when the boyfriend suggested we go to dinner I figured I could pull myself together for an evening out. We were both so hungry it was hard for us to decide on a place to eat. And since it was a Saturday night we knew we would be facing long waits everywhere. After doing a little calling around, we found out that the Dexter’s in Thornton Park has zero wait. We were there in 5 minutes. I was craving red meat, so I opted for the bacon-wrapped meatloaf. I’ve seen this on the menu before and always opted against it, but after recently watching The United States of Bacon on TV, I was in the mood for something like this. We were starving so we also ordered a side of their truffle fries as an appetizer. They were so good that we ate the whole thing before our dinners came. Both of our dinners were amazing! The meatloaf wrapped in bacon had the perfect flavor and the boyfriend’s fish came with a fried spinach that melted in our mouths. And the polenta that came with his meal was delicious too! So. Good. Fish of the Day: Snapper, served with fried spinach, shrimp, polenta and asparagus. While my meatloaf was definitely the star of the plate, the snapper had a very strong supporting cast. We were happy with both of our choices, and enjoyed our leftovers yesterday for lunch! I spent my morning drinking coffee and deciding whether I would hit up Hatha at 11:30 AM. When I got a text from a friend saying that she was at a Starbucks nearby, I decided to throw on my yoga clothes, visit her for a bit and head over to yoga. By the time I got home from yoga, I was hungry. Good thing I had some amazing leftovers! Sunday night we headed to the grocery store to stock up for the week. But first, we stopped at a friend’s house who had tons and tons of boxes that we could have for moving. She posted on Facebook that she had boxes to give away and you better believe I responded immediately. A big thanks to Lauren for the boxes! And staying true to the old rule “Never go to the grocery store hungry” we decided to stop at Gringos Locos for a quick bite. I got the sloppy taco and the double D. Both were yummy, but afterwards I was stuffed. I would’ve been fine with just one taco. A little over a month ago, I decided to take up my yoga studio on their 30-day yoga challenge. For the next 30 days, I worked my schedule like it was a puzzle, figuring out how to fit in 26 practices. Here are my final thoughts about the experience: the good, the bad, the funny. I started this challenge because I am on a hiatus from running caused by my bitchy IT band. Said IT band was hell bent on punishing me for transgressions I committed against my body while training for and running pirate peg-legging my way through the Flying Pig Marathon. The doc ordered strength training in my legs and core and lots and lots of stretching and boy did I cover those in June! My arms and shoulders feel stronger than ever and I find myself having oddly amazing posture. My legs and hips feel super stretched and there’s not an overly tight muscle in my body. My body feels amazingly relaxed, which is a vast contrast from how it tends to feel during marathon training. However, I did slack on rolling my IT band with the foam roller and the stick. Because of that, I still have scar tissue that I think needs to be broken down on my right leg. I could feel the results on this when I went for a test run on Thursday after yoga. I was only a quarter-mile into my run when I felt that familiar pressure next to my knee, so I started walking immediately. But let me tell you what, that first quarter mile was amazing! I couldn’t help but smile when I felt the wind blowing through my hair. Oh, how I miss exercising outside! Also, I have a bit of tendonitis in my right foot that I developed during my Flying Pig Marathon pirate peg-leg run. I have done little to rehab it and started to hurt more towards the end of the challenge. I’m now doing yoga with an ankle brace on and sleeping with a different compression brace and already I’m feeling better. That’s how many pounds I lost with 26 days of yoga. Considering I spent most of my time doing low impact Hatha and Ashtanga practices, and had zero free time for cardio, I’m not disappointed. I tend to gain weight when injured and not running, so I was happy to avoid that fate this time around. This is how many loads of yoga clothes I had to wash in a span of a month. However, the rest of my laundry took a hit and as a result I did much exploring of my closet towards the end of the month. Thanks, yoga challenge, for helping me get creative with old (but the only thing I had clean) clothing! I must say that I am very impressed with myself for not buying any yoga clothes during this challenge. I managed with what I had: a bunch of running clothes that would have to make due for yoga. My favorite article of clothing? An old, faded pair of yoga pants I got from Old Navy ages ago. They were the only pants I had that I didn’t have to constantly pull up between sun salutations. One day, when my budget allows for it, I will go stock up on some yoga pants. And then at the end of the month I had my sad ends trimmed. Yeah! My hair survived the yoga challenge! I didn’t get to spend much time at home during the month of June. This was partly due to the yoga challenge and a lot of celebrations with friends. It was also partly due to our house hunting. Yes, that’s right. House hunting. D and I have been discussing buying our first home for a while, and decided to start the house hunting process after I returned from my Cincinnati marathon trip. Big fans of shows like House Hunters and Property Virgins, we knew we could be searching for quite some time before we actually found our first home. Well, our search didn’t last as long as we thought it would. We fell in love with the sixth house we saw. And if everything goes well, we’ll be closing on our very first home later this month! By the way, I have to give my friend Beth big props. I met Beth in my marathon training group. She’s hilarious, fun … and happens to be a very knowledgeable and hands-on realtor. Since D and I are property virgins, she has essentially held our hands throughout this whole process. We feel so blessed to have had her by our side! If you’re looking to buy or sell in the Central Florida area, I highly recommend Beth. Three weeks straight of going full force finally caught up to me on the fourth week of the challenge. I got a cold that left me sniffling my way through downward dogs and coughing through shavasana. Sudafed was my best friend, and I somehow managed to work my way through the last week. I’ll make a note to take vitamin C next time around. Wait, you would do this again? I’m going to keep up 3 to 4 yoga classes per week for the rest of July, while rolling my IT band daily. I’ll also continue to do these short test runs weekly and hopefully I’ll be back to running by the end of the month. Thanks everyone for your support along the way!